Israeli soldiers abducted, earlier Tuesday, five young Palestinian men in Nablus, Hebron and Bethlehem, in the occupied West Bank, the Palestinian Prisoners’ Society (PPS) has reported. The PPS said several army jeeps invaded Beit Dajan village, east of the northern West Bank city of Nablus, searched the home of Radwan Abu Thabet, before abducting his son, Soheib, who is also a former political prisoner. In Hebron, in southern West Bank, the soldiers invaded and ransacked several homes and abducted Mohammad Zghayyar, a local nonviolent activist with the Youth Coalition against Settlements, in addition to Ibrahim Jaber and Azmi Abu Daoud, 19. 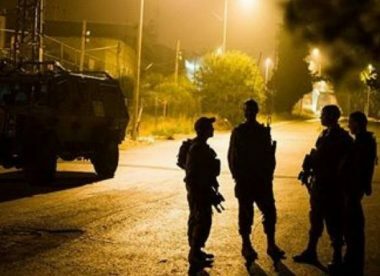 The soldiers also invaded many neighborhoods in Hebron city, and installed military roadblocks at its northern entrance in Jouret Bahlas area, in addition to the Sa’ir and Halhoul towns, before stopping and searching dozens of cars, and interrogated many Palestinians while inspecting their ID cards. In addition, the soldiers abducted a young man, identified as Omar al-Hreimi, after assaulting him at a military roadblock, north of Bethlehem, while heading for prayers in the Al-Aqsa Mosque in occupied Jerusalem.